We don't often think about warblers visiting our birdfeeders, but everyone once in a while they surprise you. I tend to think of Pine Warblers as the most likely warbler candidate at a feeder. Last week, a migrating Pine Warbler enjoyed eating the Bark Butter middle out of a Stackables sandwich at a feeder not 10 feet from my house. I've also had them in my yard eating at a seed tray and eating suet. The Pine Warbler that visited last week seemed intent on seeking out high fat suet. Besides the Bark Butter, it also tried to access suet in the suet log feeder. It was probably working hard to add weight for its migratory journey by feasting on high fat foods like suet. Jim's Birdacious Bark Butter has been eaten by 7 species of warblers across the country. I guess I'm lucky because I've had both the Pine Warbler and an Ovenbird eat Bark Butter in my yard. Ovenbirds are somewhat common visitors to the wooded side of my yard, where they'll come up the gentle slope to within feet of the house. I occasionally put Bark Butter at the base of a few trees in that area - low to the ground where Ovenbirds forage for food. Bark Butter has been eaten by a total of 102 different bird species as of this writing. What a great food to attract a variety of birds to your feeding station! Chickadee Nesting Report #6 - Fledged! My chickadees have fledged - all 4 safe and sound I hope! Following my last in-box check on June 14, I knew they would be fledging fairly soon. Both mom and dad chickadee did a great job bringing a steady stream of mealworms and other goodies into the nest. Each time they did, the raucous nestlings inside would chatter-chatter-chatter! It was such a wonderful sound. The morning of June 19, I was able to capture this glimpse of one of the nestlings as he peeked out of his home. In the early evening hours of June 19, adults were still seen at the box (above). Birds often fledge in the morning, and I got up early on the 20th hoping to witness the young leaving the nest. But by the time I walked to the box at 6:15am, no chickadees were in the area, and no sounds were coming from the box. I checked the memory card in the BirdCam and the last image was the one from last evening. The BirdCam doesn't always capture quick entries or departures from the box so it didn't catch the fledgling's exit - darn it! I watched for a couple more hours and didn't see any adults near the box, though a chickadee or two did visit the feeders. At a little before 11am, I opened the box - the chickadees had fledged! No signs of predation - still a neat little nest. One unhatched egg and a presumed 4 chickadees off into the world. One egg unaccounted for. I updated my NestWatch nesting attempt and when asked why I thought the nest was successful, I entered "Baffled nestbox. Good weather - not too hot, not too cold, not too wet. Plentiful food nearby. Best landlady in the world!" I'm glad I've added two chickadee nesting attempts to the NestWatch program because there aren't too many chickadee nests reported - only 4-5 in all New York this year. You can see where those nests are located using the NestWatch Explore Data Interactive Map page. As far as my chickadees, I hope they're doing fine. I haven't seen chickadee fledglings in the yard, so I'm hoping the adults are feeding them in a nearby location and will return with them to my feeders soon! If you watch a nest regularly during the nesting season, please consider joining the free NestWatch Citizen Science program. It would be a great activity to do with kids or grandkids! And the more scientists learn about birds, the better we can all work to protect birds. Even information about what we consider our most common nesting birds, like the chickadee, is needed. Earlier this week, I made a second nesting period visit to my chickadee nestbox. It will also be my LAST open-box visit for NestWatch. Both parents are busy-busy-busy bringing food into the box. I'm putting live mealworms out for them, which makes the food-gathering process easy for them. And they're also finding all kinds of other juicy tidbits out there in nature. The chicks are deep in the nest and difficult to see. I take pictures off a small mirror to capture 1 to 2 images that will allow me to count the little guys. When I opened the nest, they tucked their heads and didn't utter a peep. In contrast, when mom or dad go in, they're noisy little things. They've been taught well! To me, it still looks like 4 live young. Neither of the unhatched eggs are visible, if they're even still in there. So...eggs layed about May 18. Estimated hatch date June 1. Sixteen days as nestlings, so they should fledge very soon! Hopefully they'll hesitate at the nestbox opening for my Birdcam to catch them taking flight for the very first time in their lives. Until then, no more opening the nest box since as the young become fully feathered, they may leave the nest prematurely if I do. For the next week or so, I'll check on the nest from a distance, watch for adults, and listen for sounds coming from inside the box. Stay tuned for Chickadee Nesting Report #6! Trouble in the Chickadee Nestbox? My chickadees gave me a bit of a scare the other morning. Both the adults were entering the box, but their calls were different: all I was hearing was a scolding dee-dee-dee, dee-dee-dee, not the soft fee-bee songs I'd been hearing of late. The Stokes Guide to Bird Behavior Volume I describes the context of the dee-dee call as "Given in conflict situations and often followed by other aggressive actions such as a chase; used especially in territorial skirmishes." Bird calls and songs often have a "message" and staying attuned to what we hear can help clue us in to events or happenings in the birds' lives. The dee-dee-dee calls from the chickadees were persistent and urgent. They were entering the nest, cautiously as always (they always scout from a nearby tree and then fly straight into the box lickety-split. No hanging around the front door!) Had something entered the hole and attacked the chicks? Dee-dee-dee. Dee-dee-dee. My next nestbox is still 2 days away - what if something happened? So many things can happen to a box full of baby birds. Even though I've done everything I can to protect them, any number of things could have happened. The box is far enough from trees that a chipmunk couldn't make the jump but could a Red Squirrel? The portal protector is 1-1/2" diameter - if they made the jump, could they squeeze in? The jays are numerous but too big to enter. (I'm worried about the jays when the fledglings leave the nest!) Both a downy and a nuthatch have checked out the box - could (or would) they prey on the chicks? The junco I've seen on the box is not a likely threat; as a non-cavity nester, they'd be reluctant to enter the hole. But I had to check, I couldn't stand not knowing! So I approached the nestbox calling out and rustling branches. My approach attracted both parents to the vicinity of the box. They certainly were protective! One had a mealworm in its mouth and entered the box and from inside the box I heard the sweetest sound a bird landlady can hear: petite little cheeps! I was elated! There's still live babies in the nestbox and I didn't have to disturb them to find out! "Six eggs! Six eggs! ", I yelled as I jumped up and down, running through the yard, waving my arms wildly. It was Sunday morning and I had just checked the nest box. I had been keeping my expectations in check and had essentially written the nest off as another incomplete nesting attempt. After all, I hadn't seen adults around the box much and I assumed I'd find an empty box. I approached the box making noise as usual, knocked on the side of it, then nonchalantly opened it. Out flew momma bird! She had been incubating eggs! Peering in, I thought I saw 3 eggs but needed to check for sure. I quickly closed the box, ran back to the house to get a small mirror, reopened the box and was able to see 6 tiny eggs inside! I closed it up quickly, and within 1 minute, mom re-entered the box. My last check had been Tuesday May 18; I found these 6 eggs on Sunday May 23. Chickadees lay an egg a day, so that's one on Tuesday, one on Wednesday, one Thursday, one Friday, one Saturday, and one Sunday. Did I miss a teeny egg or two when I checked on Tuesday? NestWatch protocol calls for a second check-in during the egg-laying period to see if the number changes. So I checked again on May 25 - still 6 eggs. So I DID miss one tiny egg when I checked on May 18. When I checked on the 23rd, I probably caught momma on her first day of incubation. She'll incubate 12-13 days, which means that hatching might start June 3-4. I can't wait! Stay tuned - I'll share how they're doing in my next report. In December, Wild Birds Unlimited - Saratoga Springs NY on behalf of Wingscapes™ was pleased to present a first generation Birdcam to the Adirondack Park Agency Visitor Interpretive Centers (VIC). Rynda McCray, a VIC Naturalist, is pictured below accepting the Birdcam motion-activated camera from Lois Geshiwlm and Nancy Castillo. "Once again I am writing to thank you for your wonderful generosity to our work at the Visitor Interpretive Centers (VICs). Your generous donation of the Birdcam, made in conjunction with Wingscapes, to the VIC in Newcomb is very appreciated." Wingscapes had provided the Birdcam to our store for demonstration purposes and heartily agreed to donate the like-new Birdcam for use by the naturalists at the Newcomb VIC and/or Paul Smiths VIC. WBU-Saratoga adds their thanks to Bart Stephens and Melissa Morgan of the Wingscapes organization for their support of our store and the Adirondack VICs. IMPORTANT NOTE: We have recently found out that both Adirondack Visitor Interpretive Centers will be CLOSED due to state budget cuts. What a shame! We await their re-opening when our state emerges from its budget crisis. In the meantime, we hope Ellen Rathbone of the Adirdondack Naturalist blog, or one of the other VIC naturalists utilizes the donated Birdcam during this (hopefully temporary) setback. What are the three most common words uttered upon seeing doves at the birdbath? I had my Wingscapes Birdcam set up to catch the ground-feeding action in my yard today. I broadcast some WBU Deluxe Blend again (contains white millet) under the bushes. Then I pointed the Birdcam toward the Rosa Rugosa bush they seem to love. Here are some of the images captured over 6 hours today. After an initial flurry of chipmunk photos (DELETE! ), the jays visited next. Then a steady stream of juncos and native sparrows. No adult white-crowneds were observed today. Dark-eyed Junco - darker; possibly a male? The Birdcam captured just what I wanted - documenting the busy ground feeders in my yard all day long. A new Birdcam is coming soon with even more megapixels and a flash. Can't wait to try it! Guess who's lining her nest with alpaca wool? Jim's Birdacious Bark Butter continues to be a hit with our birds, especially the Hairy Woodpeckers. When I work from home, I have had days where I've refilled the feeder five times! Hairies aren't the only Bark Butter "customers"; in between their visits, the Downy Woodpeckers, Blue Jays, Red breasted Nuthatches, chickadees and titmice sneak in for a quick treat. And the Dark-eyed Juncos, not exactly first on anyone's list of suet-loving birds, visit the feeder for their little portion of Bark Butter. They'll eat from the top of the slab, or pick up crumbs that fell to the top of the baffle. 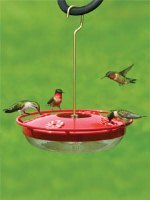 - Use it on a specially-made feeder that is hanging or mounted on a squirrel-proof Wild Birds Unlimited Advanced Pole System (APS). Squirrels love this stuff too but MY Bark Butter is FOR THE BIRDS! - Our locally harvested slab feeder is a great way to offer Bark Butter. It looks great, fits conveniently on an APS setup and is available at WBU-Saratoga Springs. - Use a Bark Butter applicator (AKA a fork) to apply Bark Butter to the feeder in a cross-hatch pattern. It should look like the top of a peanut butter cookie. - When you apply Bark Butter, remember to leave room for the bird to perch! - If you have a suet log feeder, you can put Bark Butter in the holes, or supplement the suet plugs by smearing Bark Butter on the sides of the feeder along side or above the holes. Northern Cardinal - not a percher but likes Bark Butter! - As crevices are created in your WBU Seed Cylinder (shown here on cylinder feeder), fill them with Bark Butter. - If squirrels and other critters are not an issue, put Bark Butter out on the base of a tree. This is how I attracted Ovenbirds to eat Bark Butter. Juncos can eat it easily this way too. While our Hairy Woodpeckers were feeding young in the nest, they were taking back huge mouthfuls of Bark Butter. Now we can't wait for the young to find the Bark Butter for themselves! Want to see Bark Butter in action? Here's a link to a selection of Bark Butter videos. Jim's Birdacious Bark Butter was developed after many years of testing to produce a product that attracts a wide variety of birds but is easy to apply and doesn't melt or separate. 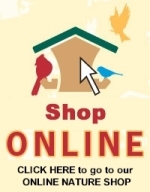 Jim's Birdacious Bark Butter is available at Wild Birds Unlimited - Saratoga Springs NY, at your local WBU shop, and online.